Starting an herb garden is easy and fun! There's nothing better than having fresh herbs right at your fingertips, ready for use. 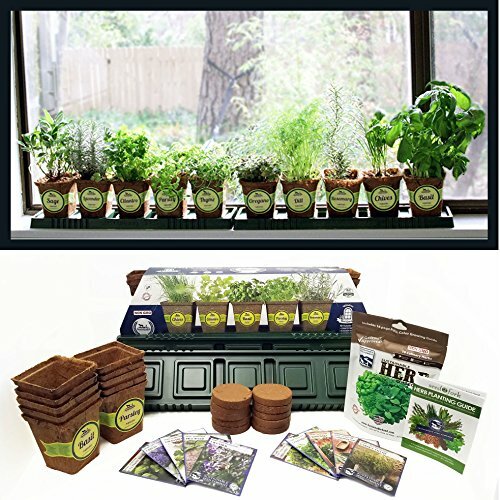 Whether you're a beginner or a master gardener, this kit includes everything needed to create that perfect indoor herb garden. This unique windowsill kit will take your recipes to the next level, a chef's dream. Our Non-GMO Culinary Herb Seed Collection is included. You'll receive full size seed packets of Heirloom Basil, Rosemary, Chives, Parsley, Cilantro, Lavender, Oregano, Dill, Sage, and Thyme seeds. You receive everything from the pre-labeled pots to the seed, we have thought of everything so you don't have to! Just add water! Bonus - We've included a full color 28-page growing guide filled with illustrations, recipes, seed saving, FAQ's and tips. Easy instructions for setting up your windowsill garden can be found on the bottom of the box.